The Symposium opened with a Keynote Conversation between Matthew Dugan, AICP, Division Manager, Long Range Planning, City of Austin Planning and Zoning Department, and Jean Eason, North Texas Regional Coordinator, Future City. Mr. Dugan leads the Imagine Austin Comprehensive Plan team. Future City is an engineering education program that teams middle school students with professionals and teachers to tackle the challenge of building a livable city of the future. This year’s Future City theme is Age-friendly Cities. Many older adults want to continue working past the typical retirement age, both out of desire and necessity. Enlightening employers about the benefits of a multigenerational workforce is key. Panel moderator: Chip Sampson, AustinUP Board member and Professional Services and Project Staff Placement Consultant. Panelists: Laura Fowler, Managing Partner, The Fowler Law Firm; Linda Smarzik, Dean of Computer Science & Information Technology, ACC; and Peg Walton, American Association of Community Colleges (AACC) National BACK TO WORK 50+ Program Director. 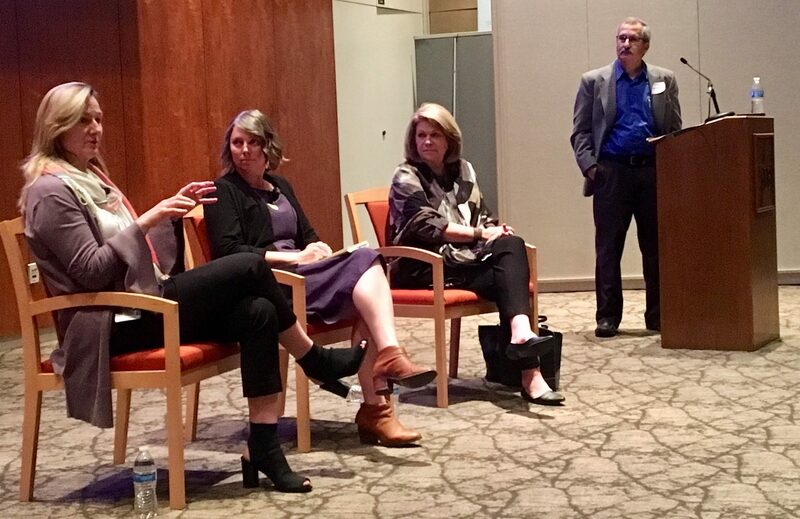 As Austin strives to create affordable, diverse and connected neighborhoods, this panel put a spotlight on innovative housing solutions and the land use codes and policies that can encourage – or block – progress. Panel moderator: Peter Varteressian, Vice Chair, City of Austin Commission on Seniors. 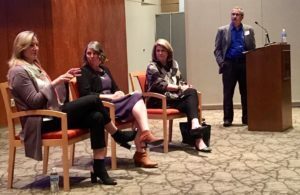 Panelists: Nicole Joslin AIA, LEED AP, Executive Director, Austin Community Design and Development Center; Mandy De Mayo, Community Development Administrator, City of Austin Neighborhood Housing and Community Development; and Diana McIver, President/Owner, DMA Companies. 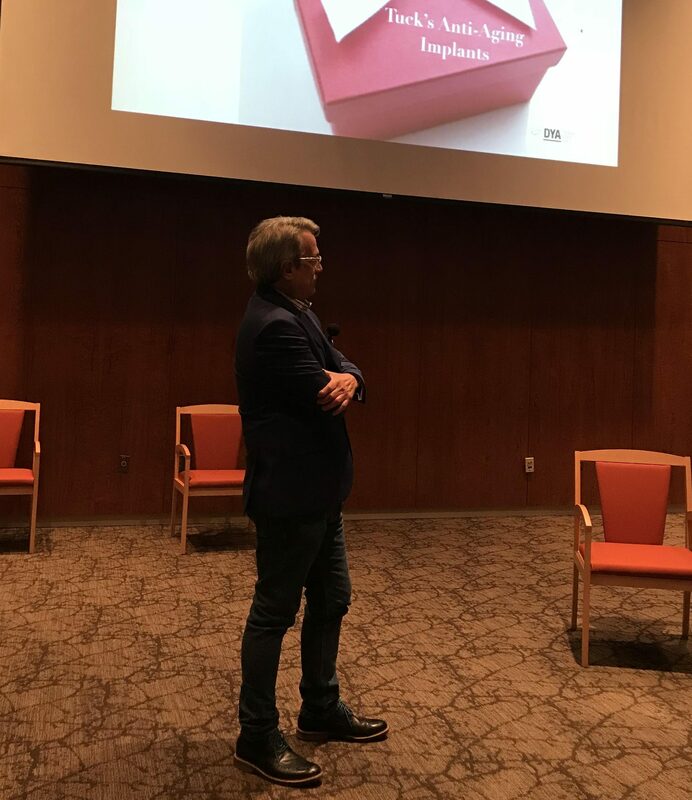 An entertaining lunchtime conversation, facilitated by author Tuck Kamin, was an opportunity for students and others to share their fresh perspectives on aging. 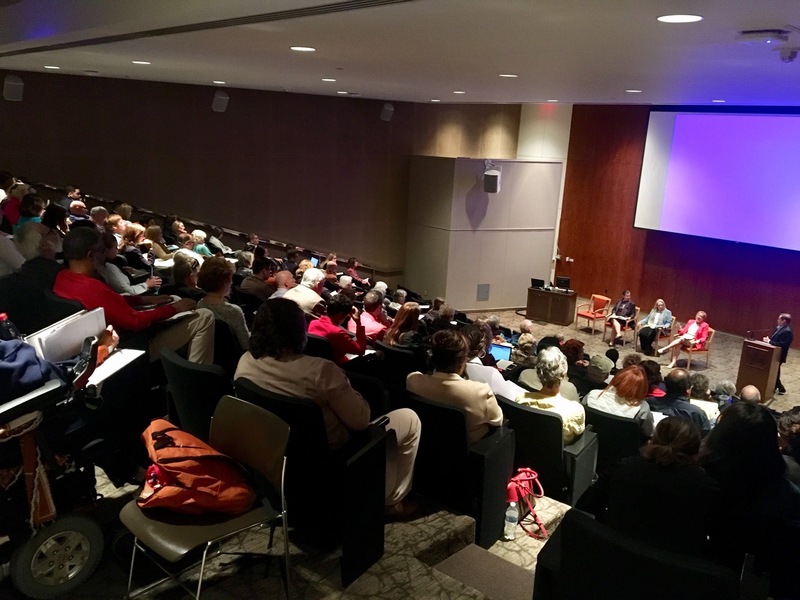 This session explored the social determinants that impact healthy aging. Panel moderator: Patricia Bordie, Director, Area Agency on Aging and Commissioner, City of Austin Commission on Seniors. Panelists: Dr. Mark Carlson, Geriatrician and Founder/Director, Be Well MD; Joyce Hefner, LMSW, Director of Housing and Community Services, Family Eldercare; Andrew Levack, Senior Program Officer, St. David’s Foundation. 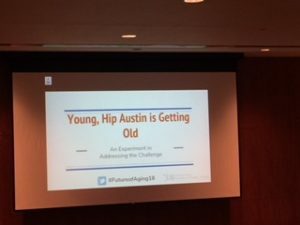 2018 LBJ School Policy Research Project (PRP) presentation, “Young Hip Austin is Getting Old: A New Experiment in Dealing with the Challenges of Eldercare.” This session included a summary of PRP findings, a panel discussion and interactive audience polling. Panelists included Seemeen Alam, CommUnity Care Patient and Board Member; Arnold Garcia, Board Member, AustinUP and Former Opinion Editor, Austin American-Statesman; and Sherri Greenberg, Professor, LBJ School of Public Affairs. The perfect event overview/follow-up piece, written by the LBJ School’s Dr. Jacqueline Angel and Andrew Scoggin, appeared in the Austin American-Statesman on Sunday, April 15. We have included it below. Thank you to our sponsors: AARP Texas, St. David’s Foundation, Westminster, Overture, Atria at the Arboretum, Belmont Village – Lakeway and StageTech. Commentary: Adults will outnumber kids in 2035. Plan for aging, Texas. Every day, the population of the United States, including Texas, is getting older. This poses important challenges to Social Security, Medicare and a host of state and local programs. In fact, the Census Bureau recently announced that it projects there will be more older people than children in the United States by 2035. We can’t afford to wait 17 years to start thinking about changes that we need to make. This new demographic and social reality gives us an opportunity to rethink how we adapt to an aging population in ways that benefit all age groups. Texans, as they have in the past, can set an example for others to follow. Changes cannot depend on a few advocates. Everyone must become aware of the issues. It takes people from different fields, backgrounds and age groups to offer solutions that truly change the way society treats the aging process. Seniors aren’t the only ones who benefit from effective policies on aging. Younger generations will age and eventually benefit. But younger generations can also reap the benefits today. In 2013, approximately 40 million family caregivers in our country provided uncompensated care that, according to the AARP, had an estimated worth of about $470 billion. Improvements in effective care for seniors clearly benefits family members who are at risk of caregiver burnout if they must provide care to an aging relative without outside help. By taking some of the burden of care off families, we can put much of this time back into the economy to help keep Texas thriving. We also have a chance to create a more inclusive society by breaking down traditional divides between older and younger age groups. For example, certain parts of cities in Texas and across the nation are becoming more age-segregated partly as the result of gentrification and displacement. In smart cities of the future, social resilience will be a key ingredient for building stronger communities and for addressing aging-in-place issues. In 2013, a research report published by the Federal Reserve Bank of Atlanta concluded that cities with a high degree of social resilience tend to enjoy numerous health and economic benefits. Put simply, it is not only the right thing to do; it is also not feasible to continue isolating adults based on their age as seniors become a greater share of the populace. Our cities in Texas can serve as incubators of innovation that make aging a healthier, less socially isolated experience. In coming up with solutions, more city mayors are establishing task forces on aging, city councils are forming commissions to inform age-related policy, and civic leaders are working with community members from all segments of the population. Cities could also create short-term plans that contain concrete steps to foster social inclusion and improve the health and well-being of seniors. Dallas, for example, has a Senior Affairs Commission consisting of 15 people selected by City Council members and the mayor to guide city staffers. And vulnerable seniors in Dallas can get help from caseworkers in the city’s Office of Senior Affairs. Dallas is part of AARP’s Network of Age-Friendly Communities, a World Health Organization initiative that also includes Austin, Brownsville, Fort Worth, Houston and San Antonio. Leaders of communities in this network recognize they must consider all factors, such as skyrocketing property values that make it hard for the elderly to stay in their homes, to maximize civic engagement and be more age-inclusive. Leaders should particularly focus on expanding public transportation and affordable housing to help seniors remain in their communities and live independently. We need to do a better job incorporating older residents into all aspects of city life. Inventiveness is part of the social fabric in Texas. We have an opportunity to make similar innovations for the aging process. The conversation must start now. Angel is a professor in the LBJ School of Public Affairs at the University of Texas. Scoggin is a Master of Public Affairs candidate at the school.